You are here:Home » Other Reads » Can You Fight Cancer with Matcha Tea? Originally consumed as a delicacy in ancient China, tea drinking dates back over 5000 years. Today, it is a second favorite beverage next to water. Tea consumption has become a daily habit in many households as nearly two thirds of the world's population drink it. Thought this special beverage isn't consumed just because it's tasty, people also want to be rewarded by its many health benefits. Matcha tea in particular has been proven to help with overall health and even fight and prevent cancer. Continue reading to find out how you can fight cancer with matcha tea. The matcha powder used to make tea comes from specially grown and processed green tea leaves. Those teal leaves contain antioxidants and compounds that have many health benefits. Many of those health benefits come from a specific compound called catechins. Catechins are natural phenols and antioxidants. The most abundant catechin found in green tea is EGCG or Epigallocatechin-3-gallate and makes up from anywhere between 50% and 70% of the entire catechin capacity. This specific compound or antioxidant is the one responsible for most of the health benefits matcha tea has to offer. That includes the teas cancer fighting capabilities. Matcha tea and its antioxidant compounds have been tested greatly over the years and have been the center of many scientific studies. These tests and studies show that matcha tea and EGCG not only heals the body but it also is responsible for killing cancer cells and helping to prevent cancer cells from growing or spreading. In order to know whether or not something is working to prevent cancer cells from growing, we must first know how and why the cells are growing. Cells within the body are capable of breaking away from their normal cycle of growth and death. This is what causes cancer to grow. When normal cells begin to grow uncontrollably they are then able to grow into harmful or life threatening tumors within the body. 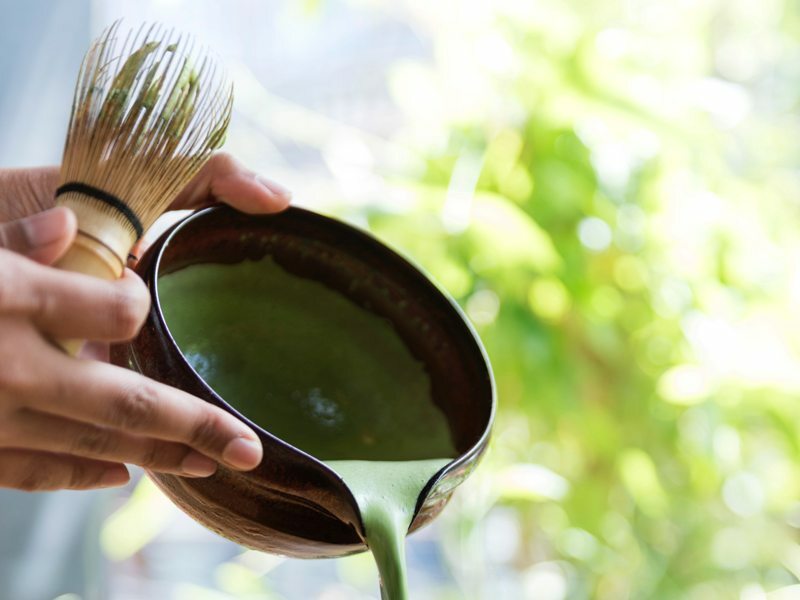 EGCG and other antioxidants found in matcha tea work to prevent those cells from growing uncontrollably with prevents them from growing into cancer cells. The EGCG antioxidants prevent cancer growth in several ways. In order to grow, cancer cells need high levels of a protein called cyclin D1. EGCG lower these levels of proteins. They also fight and block the enzymes cancer cells need in their cell cycle to continue growing. EGCG increases the levels of other proteins that make it hard for cancer cells to grow. All this must have you craving the matcha health benefits already. Make yourself a glass and start building up your levels of EGCG as you continue to read this article. Developments show that while EGCG is able to prevent cancer cells from growing, it is also able to kill existing cancer cells. It does this by attacking cancer causing proteins causing them to destroy themselves. Angiogenesis is the word used to describe the growth of new vessels in tumors. These growths provide cancer cells with the nutrients they need to grow fast and spread to other areas of the body. EGCG prevents Angiogenesis which in turn keeps cancer cells from growing and spreading. In short, the answer is yes. Matcha tea can kill existing cancer cells and prevent new ones from growing. I have yet to try this tea. I love matcha. Have been drinking from quite a while. I love to drink matcha tea, does not matter it fights cancer or not. An excellent reason for drinking macha tea! I enjoy green tea as a drink as it is so refreshing. But I don't like the flavor in desserts. I didn't know Matcha tea has so many health benefits. I love drinking tea. I'm going to drink matcha tea much more from now on! Good to know! I drink matcha green tea on a fairly regular basis. Sounds interwesting; i would like to drink matcha tea! I think a healthy diet in general rather than a single ingredient is the best medicine around.